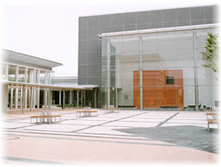 This is a patio surrounded by the entrance lobby and Hanashobu Hall, where you can enjoy events such as outdoor concerts. 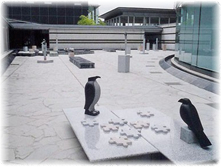 This is a Japanese-style patio where you can enjoy exhibitions of Bunraku/mechanical dolls. The bamboo patio brings tranquility. 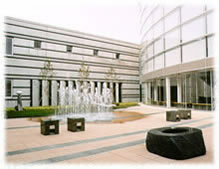 This is a bright space with a fountain, where stone objects are placed. 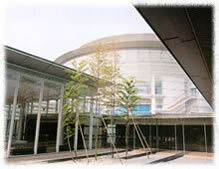 The arts works to stimulate your creative power is exhibited between Kakitsubata Hall and rehearsal room.